You never know who or what will make an impact on you -- someone who shares great ideas for solving a problem, or someone who is always willing to be a part of the solution and not the problem. Oftentimes, this impact comes from someone or some event that you least expect. As agricultural educators, we are impacted by our students, parents, family, and colleagues all the time -- people showing us time and again how to "get off the fence" and make a difference. Join us on September 25th as we celebrate National Teach Ag Day at CHS Headquarters in St. Paul, MN. 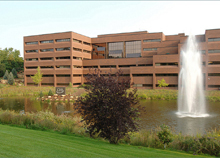 Can't make it to Minnesota? Join the live webcast with your students 1-3pm EDT, 12-2pm CDT, 11am-1pm MDT, or 10am-12pm PDT. We'll be talking about why teaching agriculture is a great career, what's it like to be an ag ed major and tips for selecting a college. Plus we'll be featuring current and future agriculture teachers across the United States and more. Click here for information on how to get involved and promote National Teach Ag Day in your classroom! Submit photos of future agriculture teachers to be included in the webcast by September 10th. Submit a group photo of your agricultural education department. Photos will be displayed during the Teach Ag Day livestream event. Deadline to submit your photo is September 15th. Find resources for your classroom to use during Teach Ag Day! We have interactive games, lesson plans, and more for all age levels. The 2014-2015 National Teach Ag Ambassadors have been announced and are gearing up for National FFA Convention! Click here to see who is representing the Teach Ag Campaign in your state or region! This spring the National Teach Ag Campaign rolled out a new program aimed at working directly with states to identify sustainable and effective agriculture teacher recruitment and retention strategies. 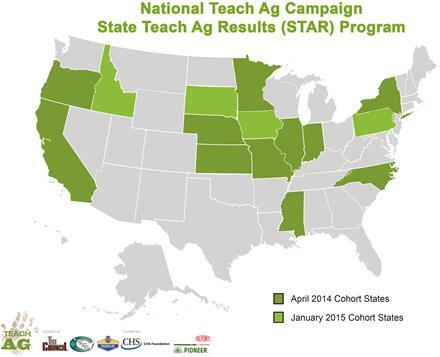 It's aptly named the State Teach Ag Results Program or STAR Program. Several information webinars were offered about the program in February and states were encouraged to submit an intent to participate by April 1st. As I boarded the plane leaving Des Moines and headed towards Washington, D.C. nervousness, anxiousness, and excitement overwhelmed me. Having never been to our nation’s capital before, I wasn’t entirely sure what to expect. Read a first-hand account from agriculture teacher Shawn Dygert about how team ag ed is working together in Idaho to move agricultural education forward. 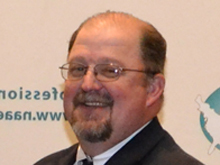 Shawn is also the State Advocacy Leader for the Idaho Vocational Agriculture Teachers Association. NAAE Convention is right around the corner. Mark your calendar to join us November 18-22 in Nashville! Welcome Tractor Supply as our newest sponsor of the FFA Community on CoP! FFA Required for Ag Classes? Thinking about running for a regional secretary or vice president position? Your Memorandum of Understanding is due September 15th! Congratulations 2014 NAAE Award Winners! Congratulations to this year's regional winners. See who won, and get ready to celebrate their achievements at NAAE convention in Nashville! NAAE would like to thank Mrs. Savannah Robin for her service to our organization as the Meeting Planner and Advocacy Coordinator. She has recently accepted an agriculture teaching position at Harrison County High School in Cynthiana, Ky. Best of luck in this next chapter of your life Savannah! Support the National Teach Ag Campaign by giving today. Your gift will help ensure that students across the country have access to a high quality agriculture teacher. In-depth and timely content on AgEdNet.com provides variety of tools for agriculture instructors and students. Congratulations 2014 Agriscience Teacher Ambassadors! DuPont invited 49 of the nation’s finest agricultural science teachers to participate in the 2014 National Agriscience Teacher Ambassador Academy this summer at DuPont’s Chesapeake Farms in Chestertown, Md. In order to help her students visualize animal science concepts, Amanda Ross, agricultural educator at Palmyra High School in Palmyra, Mo., created large plywood cutouts of a cow, chicken, and hog. Terry Branstad is Iowa's longest-serving governor, holding the position from 1983-1999, and was re-elected to the position in 2010. Throughout his tenure as governor, Branstad has fully supported agricultural education. NAAE will recognize state associations who have aggressively engaged in certain well-planned activities designed to serve the best interest of the members and the profession.